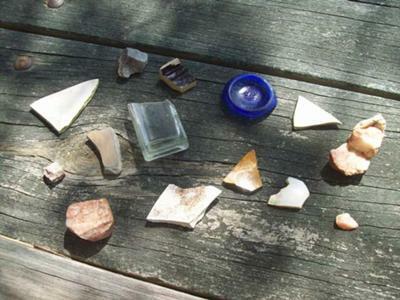 I was there this weekend and found lots of pottery shards, plate fragments, and bottle fragments. The picture does not do the pieces justice. The cobalt bottle base is from an old medicine bottle that dates from 1880-1920 made by the Mulford Co in Philadelphia. It is very sparkly from wear. The plate and cup fragments were beautifully crazed and had blue doves and pink roses. While none of these would be considered "jewelry quality," I enjoyed combing the river beaches!